Our small group is studying Daniel and a topic that we discussed last time we got together seems to line up exactly with this definition. Daniel expected God to come to his aid, so he put different steps in motion than I probably would have in his place. I believe that we can and should apply this idea to our faith, just as he did. In chapter 2 of Daniel, we find the King Nebuchadnezzar is demanding an interpretation to a vision he’s had. When he finds they can’t meet his demands, he orders all their deaths. Daniel doesn’t know about any of this, even though he is among the ones that have sentenced to death, so he goes to the captain of the guard to learn what’s happening. When he hears that a dream is the cause of the trouble, Daniel immediately sets up an appointment with the king to interpret it for him. Then, Daniel goes to his friends and asks them to pray for him to receive the interpretation, which he receives in a dream. The part of this story that is about expectation is the moment right after he talks to the captain of the guard about why he’s been sentenced to death. The moment that he heard the reason, he went to get an appointment with the king. THEN, he went and got prayers. First, he took action, then he begged before the Lord with his friends. I’m sure there was prayer coming out of him the whole time, as this was probably a very intense time for him. I’m not trying to say that we should not pray before taking an action. I’m saying that I think we should trust our relationship with God enough to know when to take an action and when to stop and pray before taking that action. What he told his friends to do was to, “seek mercy from the God of heaven concerning this mystery.” That doesn’t sound like what you ask for when you’re confident of the answer. That sounds more like asking to get the answer, which means: Daniel didn’t have the answer when he set up the appointment with the king. He had no idea what the dream was and he didn’t know the outcome of the conversation that would happen. Daniel knew something far more important. Daniel expected God to help in his time of need, not just wishing for it. He also knew that he had to ask for it from the Lord; he couldn’t just waltz into the king’s court unprepared and expect the Lord would hand answer to him. Daniel walked the line of expected God’s answers and taking the action that happens as a result of that expectation, while still staying humble before the Lord and seeking Him in all things. I wish sometimes that writer of the old, old parts of scripture could be alive today and tell us how their passages of scripture would be written today. Proverbs 4:20-27 is one of those passages. Since I don’t have their input, I like to rephrase it as I understand it to help me find ways to apply these truths to my life. My child, study the word intently; absorb what it says and choose to fill your ears with the truth of the words. Don’t let distracting media take your eyes off the beauty of God’s word; keep it fresh and bubbling up inside, ready to be called on at a moment’s notice. The joy of being alive can be felt deeper and more intensely by those who understand the beauty that God has placed in His Word. It brings refreshment to the mind and relaxation to the body. Protect your thoughts and be aware of your self-talk, because the flow of your life is determined by your internal dialogue and focus. Don’t lie. Don’t gossip and don’t trick or manipulate. Ever. Don’t let comparisons distract your or consumerism entice you. Look at what God’s given you and stay focused on the work He’s laid out in front of you. Don’t live by accident. We weren’t put here to be pushed around mindlessly. Instead, think about who God made you to be and what work He’s asked you to right now. Think about your choices and live in such a way that you can become your best self through each and every choice you make. It’s easy to feel that you made a mistake in your life choices or that you shouldn’t have chosen something that you did. Unless it’s a sin that you’re needing to turn away from, don’t give up on what you have. The choice you made is the choice you made. Walk it all the way out and see what God can do with everything you bring to Him. God says His burden is light and His yoke I easy. Many days, I feel that. Some days I don’t. Temptation can easily come in and put a weight on us that we struggle under. But, we know who God is and He tells us how to live our lives. As we choose to believe in Him and accept His words, the burdens of this world begin to fall away. This passage reminds me of the choice that is in walking with Him. I choose to walk with Him even when circumstances call me to doubt. I choose to keep my eyes on Him and live ethically even when immorality would be more fun or easier. I keep His Word near to me so I can learn more about Him every day. Nehemiah was a prophet who lived in the time that the Babylonian exile ended. At the time that the exiles were returning to Jerusalem, he had been in the court of the king in Babylon. But, when he heard that Jerusalem was destroyed and walls in ruins, he gave up his high position and went back to help rebuild the city. Part of what Nehemiah did for the people was to teach them about the Law of Moses. Over the seventy years of captivity and exile, the habits and traditions around keeping the law had fallen away. The first part has two elements to it: knowledge and understanding. The people weren’t being rebellious or defiant; they simply didn’t know what they were supposed to be doing. Nehemiah doesn’t try to correct behavior first thing. He knows that they have to know the truth of God and be taught it. It might seem like splitting hairs to say that knowledge and understanding are different, but the nuance of them is captured in the part that says, “They read from the Book of the Law of God, making it clear and giving the meaning so that the people understood what was being read.” (v.8 NIV). They didn’t just put the words out there and tell the people to start a Bible study if they didn’t understand it. They explained it in such a way that they understood what they heard. They now had the knowledge of the law and the understanding of it as well. The second piece of this is connection. Religion is an abstract concept. It is an idea that we can’t always define quickly and easily. These abstract concepts include things like: there’s a powerful being who is intelligent and loving, but invisible and intangible, and ideas like love, mercy and justice. Even if the intangible is acknowledged, it can be difficult to apply this knowledge to our lives, or, said another way, to care about it. To take all these things and believe that they are real and important enough to be willing to change our lives for is a huge step of faith. This step of faith can only happen when something connects us with the truth that’s in the knowledge we’ve gained. Knowledge alone isn’t enough, in most cases, to change a person or commit their steps to a path that will cost them personally with no earthly gain in site. That kind of belief is found only in the presence of the Lord. Only when we accept the words of understanding and allow them to connect us to His Spirit. This is why the people wept, because they were so overwhelmed with the Spirit that they felt the connection to Him deeply and personally. The next piece of this story is the supportive leadership shown by Nehemiah and the Levites. All of Israel is gathered here and is crying. I imagine that some of the Levites were a bit overwhelmed by the people’s response. Thousands of people crying would be intimidating! Fortunately, Nehemiah knew what was happening and knew how to support the people as the Spirit was working in them. He offered them a day to celebrate the goodness of God while they absorbed the love and knowledge they’d gained. He sent them home, telling them, “Go your way. Eat the fat and drink sweet wine and send portions to anyone who has nothing ready, for this day is holy to our Lord. And do not be grieved, for the joy of the LORD is your strength.” (v. 10). The first time you feel the moving of the Spirt, you might not know how to handle it. 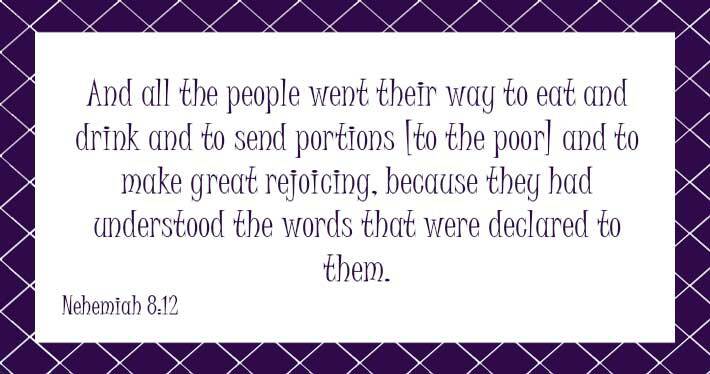 Nehemiah is given them the opportunity to enjoy the moment and to have a good meal (eat the fat) and make sure the poor in the group can enjoy a good meal as well. The final part of this is the willingness to obey. In the next section of chapter 8 and 9, Nehemiah and the other leaders and priests start implementing what they’ve been reading in the Law, right away, no wasted time! The people celebrate and rejoice in this and join in wholeheartedly. When we’ve been brought into a new understanding of God’s truth, we need to be willing to step into obedience as well, without hesitation and with wholehearted devotion. This is the only way we can see the true change in us: hear it, understand it, celebrate it (leaders support it), and do it. In Luke 17 Jesus gives an example of what it means to have a heart for obeying the Lord. He is addressing the assumption that when we obey the Lord we’ve somehow done something amazing or something worthy of note. Instead Jesus says that when we obey we’re supposed to simply acknowledge that we did what we were supposed to do, not seek reward and attention for it. Earlier in Luke Jesus is talking to the seventy-two that He sent out ahead of Him to help with the harvest, teaching and healing. When they came back, they were amazed at the miracles they were able to do in Jesus’s name. Jesus’s response? Yeah, it’s cool, but you’re getting excited about the wrong thing. Jesus reminds them that He saw Satan fall from heaven and that they were given authority over all the power of the enemy. That seems like something to be excited about! Having the ability to thwart the plans of the devil with a word would seem like something to celebrate. 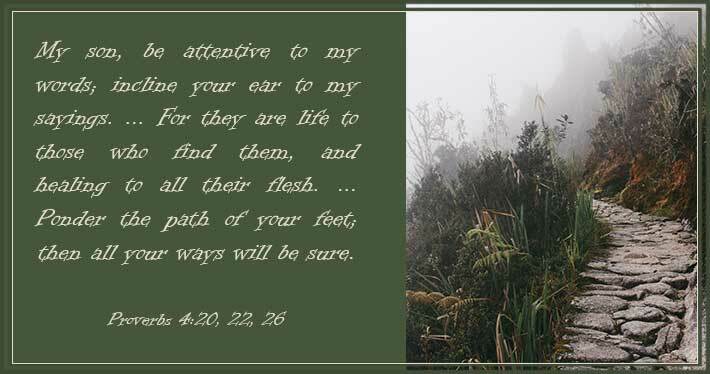 Jesus, always wanting our hearts focused on the eternal, stops them. He specifically says don’t rejoice in this. Instead, rejoice because we’ve been saved. What is your motivation in seeking miracles? Why do want to obey and serve Him? 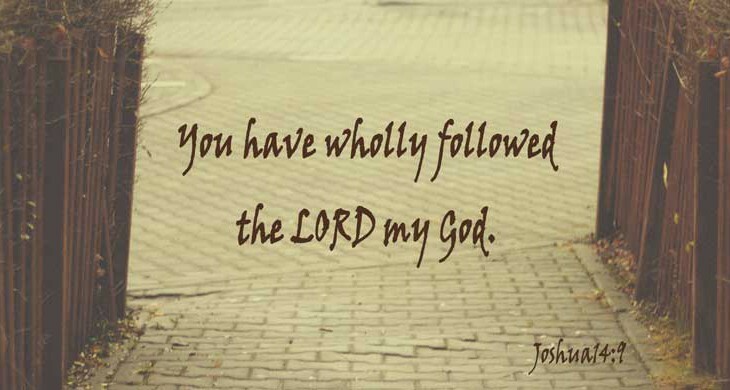 What are you seeking from Him as you walk with Him? Is it a quid pro quo kind of thing? If you’re honest about what’s in your heart, what do you see yourself receiving from God: attention and miracles? Or are you a humble servant who views obedience as nothing but your job and celebrates the salvation of God over the blessings of God? For many people the New Year is a good time to think about new changes and improvements in our life. This series is about choosing to use this year to build a deeper relationship with Christ. On the earth, there is a weather phenomenon called the Intertropical Convergence Zone. This is an area where the trade winds converge and cancel each other out. Sailors call this area the doldrums. There’s not any wind and wind powered boats can’t move through this area. Often our relationship with God falls into this pattern where we find that we’ve lost the passion in our relationships. We try to fake it. There’s an idea that if we go to church we often feel like we have to have it all together. We know that we’re here to worship the most powerful God, but we feel pressure to put on a face, to pretend that everything’s alright. The heart of COTFC is to minister to people in this place, those who don’t have any hope in church or change. The end of all things that are not in the Lord. We need to be spiritual revived. This revival, however, is not due to anything you do. It has to do with what you choose. This goes back to the Garden of Eden (Genesis 2:9). In the garden, there was two trees, the tree of life and the tree of the knowledge of good and evil. We tend to gravitate to the second tree, we try to understand things instead of focusing on our spiritual life. When we are feeling stuck, we move to the knowledge tree. It ends up pulling us in like quick sand and the more we struggle, the more we get sucked into knowledge which causes us to strive and struggle more and the cycle continues. Some churches teach that to be spiritual or Godly you need to do more of something. Example, struggling? Read more. Reading 2 chapters a day? Read 4. They use the example of Jesus asking Peter to stay up just an hour to show that our prayers should be an hour long. If that’s where you are, you’ve missed it. Jesus said to the Pharisees that they searched the scriptures for life, but they missed that He stood in front of Him. One of the first steps to breaking out of spiritual apathy is to acknowledge that there is nothing you can do to make God love you any more or any less. We do not need to try earn His approval. Romans 5:8 Christ died for us while we sinners, not while we were getting things right. When we have the feeling of “getting” to do something, we are more likely to do that then when we feel like we “have” to do it. Anything that we feel like we are forced to do, we are going to stop doing when our motivation leaves us. Anything that we get to do, we are going to do because we enjoy it and not because we feel that someone is going to fail us or condemn us if we don’t. Are you in the do more camp where you will never be enough because you are seeking what you already have? Are you in the camp of life to be given life through the blood of Christ so you can then turn around and obey out of delight? 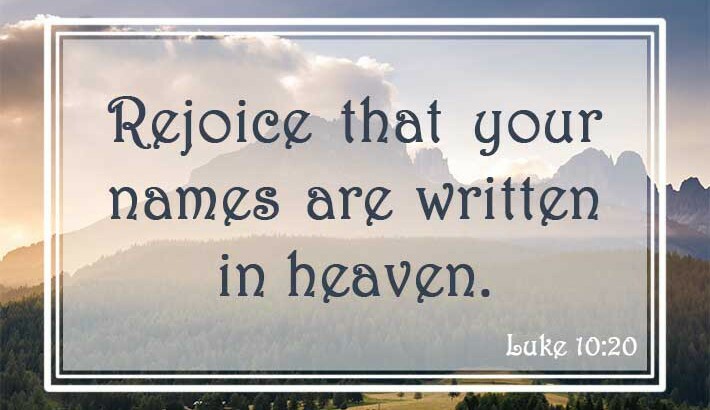 In Luke, Jesus tells a parable about two people who heard His words. The first stood and the second fell. This parable can give us insights into not only how we should live, but what to expect of life. The imagery in this parable about the flood is especially timely as we pray for our friends across the state and country that are dealing with rising flood waters. We can learn much about spiritual preparedness from seeing the troubles with the rivers. The key thing about the parable of the two house builders is that both of them heard Jesus. Imagine with me that they both went to church as kids, went to VBS in the summers, and lived fairly decent lives for the most part. This is the part about hearing. We are so blessed to live in a place where churches are common (at least, here on the north edge of the Bible belt, anyway), and we can associate freely with others who share our faith. It’s easy to assume that all the people in our circles are making the same choices we are, but it’s not true. Not everyone who is hearing is building the foundation as we are. Christian culture is wonderful, don’t get me wrong, but Christian culture itself isn’t what we should be striving for. Without the foundation of obedience, it’s just a nice place to live, at least till the waters rise. Back to our imagining, we see the two house builders again. However, one has been actively finding ways to incorporate the teachings of Jesus into his daily life. He doesn’t just smile and nod when the preacher makes a good point and then sleep through the rest of the week. Instead, he digs into the word himself and finds ways to make it real in his day. He chooses habits that are founded on putting the Lord above everything else and loving his neighbor. There’s no hypocrisy here, but honest living and seeking God. The second builder is living a nice life as well. It’s the same suburbs and similar lifestyle as the first builder, but something is different here. This builder didn’t bother with making habits that incorporated what he learned in the Word. He barely reads the word himself. After all, why bother when he sits through a sermon every week? He wants good things in his life, and he tries to raise decent kids, but there’s no daily searching for God. Instead, it’s more about maintaining status quo and not creating ripples in his world than any kind of devotion to living his beliefs. At this point in our journey, there’s little difference. On a sunshiny day with grass and flowers all around, builder two might look like the better option to go for. He isn’t so disciplined about dull religious things, seeming to have more fun the first guy, overall. Then the waters rise. Trouble comes, and it doesn’t hold back. The houses are being tested and tried. Any weakness will be discovered as the rushing, powerful waters surge around the dwellings that have been build day after day. The difference in the builders suddenly matters more than they could have known. The first one leans into his habits. Troubles rise around him, but he leans on the truth that’s he learned. His habits carry him through when his feelings of goodness have abandoned him. The darkness doesn’t cause him to fear because he has practiced the knowledge of the God’s nearness. His house stands, firm and solid. It will outlast the storm and stand as the waters recede. The foundation is firm and the day to day living created a haven in times of trouble. The second builder isn’t so fortunate. As the waters pour around his house, it immediately begins to crumble. Doubt rushes in and anger at his situation. He can’t believe God would let this happen to him! He didn’t miss a Sunday morning service, and he loved and cared for his family. Why did his house have to face troubles? 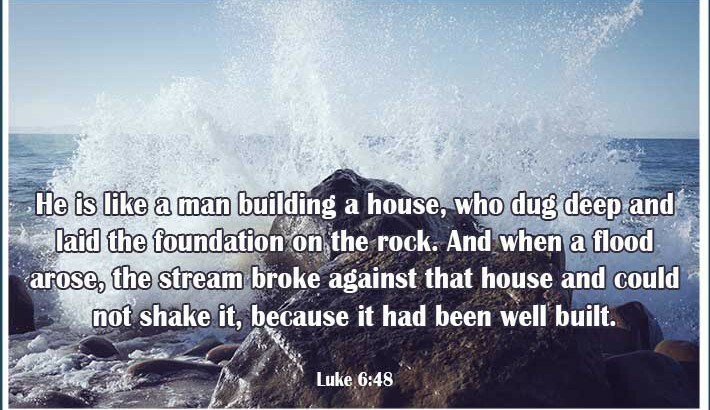 Realizing that the problem lies in the very foundation of his house, he tries desperately to build walls and stack sandbags to keep the trouble at bay. Surely, the last ditch effort will be pitied by God and the house will stand. But, no, the troubles come anyway. The water rises, no matter the effort and the small walls raised too late can’t keep the torrent away. As the powerful surges break against the house, it begins to cave and float away. Jesus’s parable reminds us that troubles aren’t a sign of believing or not believing. Troubles come at all of us. The book of Matthew says that it rains on both the just and the unjust (Matthew 5:45), meaning that life happens to all of us, no matter our standing in the world. How we weather the troubles of life is dependent on our habits, our thoughts and focuses in life. How much time do we spend experiencing the Lord in our life, versus simply learning about the Lord in church? Are we really building habits that mirror his teachings, or are we fitting in to the culture around us, some of which happens to line up with his teachings? The storm is real and it’s not just one storm. Little things every day wear at us and threaten to wash away part of our foundations. With the words we say and our reactions and our choices, we either build up our house to withstand the waters, or we are ignoring our foundation for small walls that wash away. Let’s focus on choosing our foundation to be in the Lord Jesus Christ and building habits that reflect our devotion. Nehemiah was an Old Testament prophet who went back to Jerusalem and helped to begin rebuilding the wall and temple there. It was far more than just a physical restoration, however. The people hadn’t kept up on what the Law said and didn’t follow it, sometimes even when they did know what it said. Nehemiah came in to build the physical city, but also to begin restoring the spiritual state of the people’s hearts. One example of how he does this can teach us a great deal about what it takes to make Godly change happen in our lives. When Nehemiah came back, he found that there was a thriving market happening in Jerusalem on the Sabbath. They were working and selling as if it were any other day of the week. Upset, Nehemiah challenged the leaders about and called them out on it. He reminded them that their fathers had done this and they had been punished for it. Often we are afraid to challenge things in our lives, especially things that have gone on for a long time or are in some way bringing us benefit. Jerusalem was a wreck and while there was some returning of the economy, it was hardly the thriving city it had been. While the scriptures don’t tell us what the reaction to Nehemiah’s cleansing was, it is not difficult to image that there were many people who didn’t want to lose the market and the money that went along with it. Nothing about the situation or any seeming benefit from it caused Nehemiah to see sin as anything other than sin. He knew that God wanted His people to keep the Sabbath holy, and he could also clearly see that they weren’t doing that. Instead of pandering or trying to convince people to agree with him first, he came out and talked about the sin. In addition to this being a way of life, many of the merchants weren’t Jews. They didn’t have to follow the laws the Jews did. It might have been tempting to say that they could stay. But, since the non-Jews selling to the Jews was profaning the Sabbath just as much, Nehemiah didn’t even let that argument stand. Nothing would profane the Sabbath as long as Nehemiah had something to do about it. In order to make the changes happen, Nehemiah locked the gates at the beginning of Sabbath (sundown on Friday). No one could come in to sell for the full Sabbath day. This is the crux of the change. Nehemiah didn’t start a petition or a committee to talk about ways to phase out the profaning of the Sabbath. He drew a line and said, no more. He found a way to stop the sin from continuing on. We must be willing to do this in our lives. Unfortunately, it’s not often as obvious or as easy as locking a gate to keep merchants out. Our troubles usually are more entwined with people and circumstances. No matter how complex the situation or how much we really like what we’re doing, as soon as we are enlightened to the sin, we must be willing to draw lines and make changes. 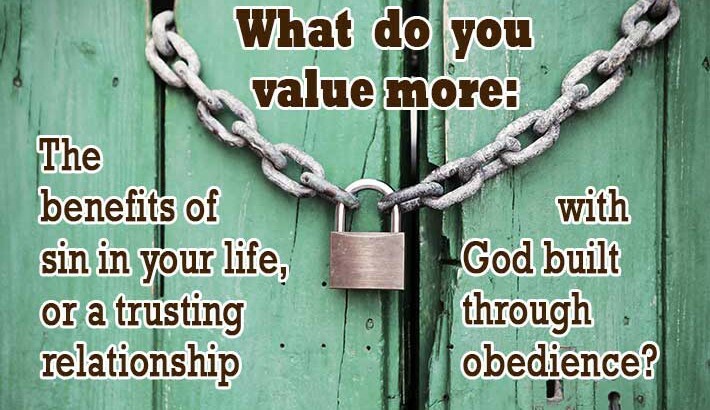 What do you value more: the benefits of sin in your life, or a relationship of trust built with God through obedience? This also isn’t just a once and done event. After locking the gates, Nehemiah saw that some of the merchants had set up camp outside the city. How often does this happen? Just as we feel we’ve made progress on getting sin out of the center of us, we find that it’s set up a place right outside the door. It’s waiting right nearby to tempt us and try to take advantage of the first slip up we make. Nehemiah knew that wasn’t a good option either. He went to the camped out people and threatened them if they didn’t move along. Sounds extreme, but Nehemiah knew that concession to temptation, even if in and of itself it isn’t a sin, is the first step toward failure. The camping out merchants had to go because they only reason they were there is to take advantage of a mistake. We need to protect ourselves with as much wisdom as Nehemiah. Don’t allow a backup plan to exist for if you mess up. Don’t keep a temptation close at hand for when you mess up; by keeping it close, it becomes a guarantee of your failure! If your heart wants your troubles nearby, it’s most likely because transformation hasn’t truly happened. Guilt may have happened, even conviction might have happened. However, transformation hasn’t. Transformation happens when we encounter God and His presence alters our very being to make us want Him more than anything else. Transformation makes us take precautions that protect our best interests: obedience. No more fudging or hiding a reserve supply of whatever it is that we’re into in the back of the closet. We draw clear lines and we find ways to remove the lingering temptation. Accountability with others who love us and want the best for us is one way that we can do this. Just because they finally got the Sabbath issues ironed out when it came to the merchants, there were more Sabbaths ahead. We can’t just get things right for the day and congratulate ourselves on a job well done. This is about establishing habits that set us up for a deeper relationship with God. 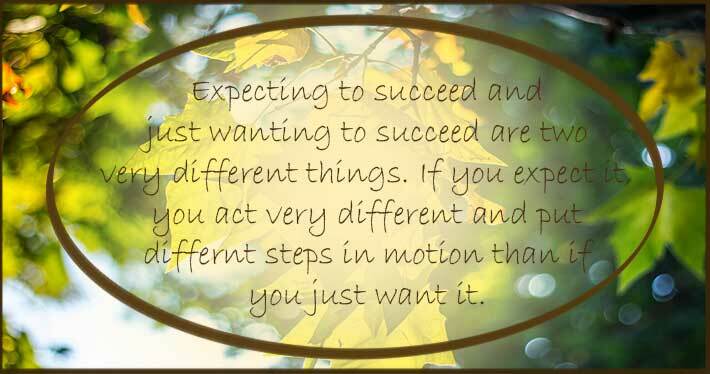 It doesn’t mean striving for perfection, that’s not the goal. The goal is a real relationship with God and real relationships require give and take and showing up day after day, messy or dirty or late or whatever. Show up to be with God as you are day in and day out and watch the power that He allows to flow into your life. When we think about sin, we often immediately have an image that includes dire and negative consequences. Sometimes, we even have an overgeneralized image of sinners in our mind that they are blind and unable to see the negativity of their choices. There is something else to consider about sin, however: it has its own kind of sweetness. A deadly sweetness, but it must have something to pull you in. Temptation only exists when there’s something that you think is worth having at the expense of obedience. 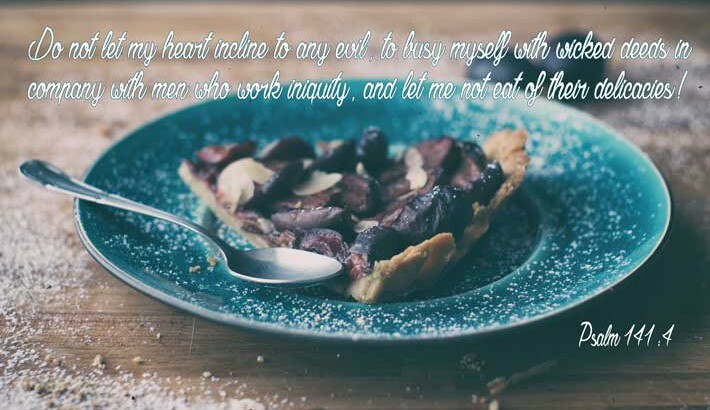 After we’re sucked in and pulled down into a full rebellion against the Lord, there is very little sweetness left in sin. The eternal consequence of sin is even worse. It means eternal separation from God, cast of in place where there’s wailing and gnashing of teeth (Luke 13:28). There will absolutely no joy or sweetness in sin then. In a poor, agrarian society (meaning most people would be farmers on small farms), foods made with rich food would have been a treat of the fortunate and rich. Often when we see people living in the results of sin, they often have a good life. They have money or fancy things. Maybe they get the vacation that you’ve always dreamed of. Maybe it’s something as simple as wishing your life was more fun. It’s easy in that moment to wish you could eat of their food, to have the perks of their lifestyle. Stepping away from this type of temptation (and we all face it, don’t think we don’t!) is more challenging than it might seem. In the heat of the moment, when we are faced with the choice of going for what we want at the cost of our conscious, we have to remember David’s prayer. Walking in a healthy, close relationship with the Lord is worth all the treasures and adventures of a lifetime. As the psalmist says, “For a day in your courts is better than a thousand elsewhere. I would rather be a doorkeeper in the house of my God than dwell in the tents of wickedness” (Psalm 84:10). 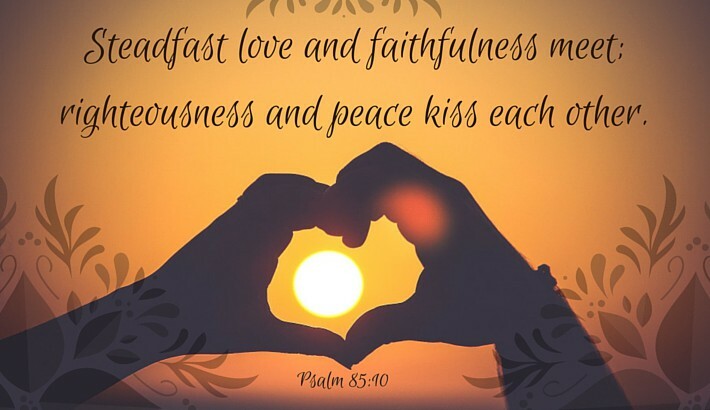 When we are facing this, here are three verses that we can whisper to ourselves to help remind us that God is a good, giving Father who knows the desires of your heart and wants to bless you (Psalm 37:4). When we choose to accept His blessing in His time, He can bless over and over. Choosing to take our desires in our own, sinful way keeps His loving arms away (Jeremiah 5:25). In Numbers chapter 13, we see Caleb, a strong man of God among the Israelites who left Egypt, choosing to be the losing voice in a pressure filled situation. Caleb was one of 12 men who were sent to scout out the land of promise after leaving the slavery of Egypt. They were told to look over the land God had given to them and report back to the Israelites. After their spying trip, they met up with the people and delivered a report: it’s good, but not that good. They agreed that it was bountiful land flowing with milk and honey, but it also happened to have big cities and big dudes in it (Numbers 13:32-33). Imagine, if you will, standing in the stead of Caleb. Not only do 11 of the leaders of the Israelites disagree with you, the people are most likely going to side with them. Who wants to face giants and walled cities? Think of the most peer-pressured situation you’ve faced and how it felt to be up against it. Imagine the adrenaline and the physical pressure and stress of wanting to go against what the others are saying. If you go with the flow, no troubles. If you stand against it, even your own body reacts, sweating and shaking. There’s the fear of what others will say or even do if you don’t agree with them. I imagine that Caleb felt all that. He not only had the peer-pressure of the situation, but he’d seen the threats first-hand. He knew how big the cities were and how strong the enemy looked. In spite of all that, he chose to be the losing voice and stand up for what the Lord had promised. He not only voiced his opinion, he made sure the whole crowd was quiet before he started speaking, “Let us go up at once and occupy it, for we are well able to overcome it.” His response showed no fear and sense of urgency. He wanted to go right now and occupy the land. The giants? The cities? No worries, we got this! Caleb was the reminder voice. Caleb was God giving the Israelite a final choice to obey him. In spite of all the blessing of God and Caleb’s dissenting opinion, the Israelites chose to take the deceitful path that seemed safer, but really took them away from blessing. How heartbreaking for Caleb! His words make him sound like a passionate type of person and I can’t imagine how frustrated and disappointed he was that they’d chosen so poorly. It’s easy to think that the story stops there, but it doesn’t. God isn’t done with his faithful servant. We find Caleb again in two places, Deuteronomy 1:35-36 and Joshua 14:6-15. First, in Deuteronomy, Moses tells us something special about Caleb. God had seen the faithfulness of Caleb and he’d remembered him and let him enter the Promised Land when everyone else who had been his peer was condemned to die. The next time we see Caleb, the Israelites have entered Canaan and started claiming the land. They’ve reached the part of the land that Caleb helped spy out and he goes to Joshua (the only other person who was allowed to enter the Promised Land from that generation). What a crazy life! He’s now 85 and he’s just as strong as he was at 40. Granted, people in this part of the Bible are living a little longer than we live, 100 – 120 years. But even with that slightly longer lifespan, 85 is still pushing the higher end. And to say that his strength is the same, and he’s ready to fight? Amazing! I wish I could know the sweetness and victory in this moment for Caleb. He had to endure 40 years of wandering in the dessert with the faithless generation. But here, finally was the answer to the prayers he’d been praying, and he wasn’t going to miss out at all! When we have to wait for blessings that we know God is holding for us, sometimes we can feel that it won’t be as good or we won’t be able to enjoy it as much, if we’re too old. But when God promises something he’s faithful and He doesn’t go half-way. He blessed Caleb and, on top of the blessing, he gave him the strength and energy to do what he was willing to do all those years before. God is good and His blessing are amazing! It’s always worth the cost of obedience and God will never, ever forget His servants.